It’s been a long time coming but finally I bring you the first new theme of the 2013-14 season! I was going to go with a member’s recent suggestion, or a more summer-influenced theme this month but then I got inspired by a new editing / sound design technique I picked up from Douglas Murray on the Designing Sound website the other week, which led me to thinking of applying it to our latest theme. As you’ll see from the link, the tip shows you how to create endless fill, or tone, from a tiny sample of an original recording. As a post sound dialogue editor this technique is a lifesaver for when you’re struggling to find clean bits of ‘air’ from sync sound to connect lines of dialogue together in a scene. However, Douglas also mentions he uses it for sound design tasks too, which got me to thinking how it could be useful to bear this trick in mind as we collect our room tone recordings. Basically, I primarily want us to build up a standard collection of room tones as you’d expect: I’d say anything between a minute and a half to five minutes is a sufficient duration. Recordings need to be neutral, in the same way as was required for the City Skylines collection – this is the indoor equivalent. No bumps, bangs, voices, car horns, etc – just neutral indoor air to be used as a sound bed in a scene. There can be a sense of distant traffic but once again, as with the City Skylines collection, it must be a wash rather than contain any specific vehicle details. Level-wise, bear in mind what volume these recordings will be used at – you don’t want to have to pull the volume down loads on the recording every time you use it, but you also don’t want to have to boost it loads either. Think about the volume it plays back at when played at unity. Ideally, when prepping a scene, I like to have to pull atmos beds like room tone down by about 5-10 dB from their recorded level. Other than that, all I can add is – be as adventurous or as unimaginative as you like! If you can get recordings of unusual spaces then that is fantastic but even if you just get a recording of your living room, bathroom or kitchen then that’s still really useful – all spaces vary slightly in character plus the particular way you record it will give it it’s own feel too (e.g. wider or narrower stereo image, closer to the window, etc. plus everyone’s own ‘outside world’ inevitably influences the indoor tone even when it’s very quiet). 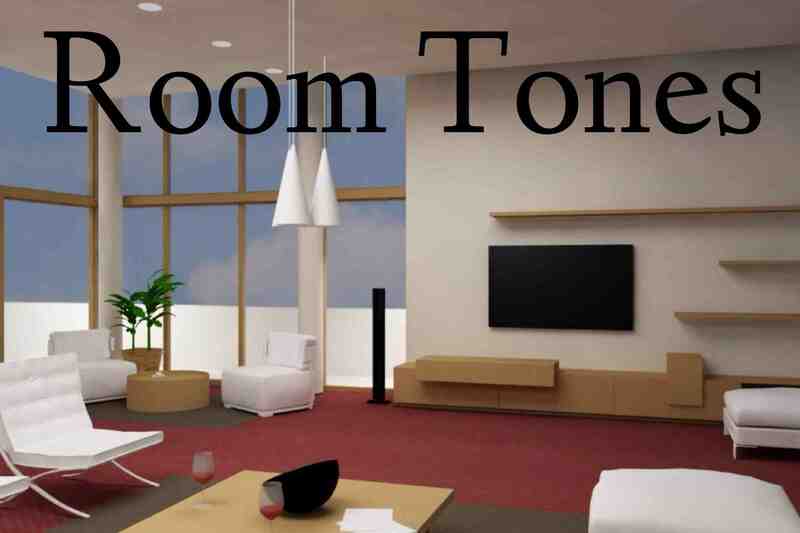 I’ll re-emphasize an important point though: make sure your room tones are quiet! No-one wants to have to go through tracks editing out bumps and bangs, tap drips, car passes, etc. – make sure these recordings are nice and clean! I’ll also add that this is not the ideal theme to use handheld recorders or cheaper equipment for, due to the inherent hiss that will be likely to show up in these quieter recordings. Now for the twist: many times I’ve been recording in an interesting building (or in underground spaces, or quite busy places, for example) and got all kinds of interesting short sounds but often, for one reason or another (such as you’re not really meant to be recording there! ), I’ve simply not been able to get more than about 5-10 seconds of clean room tone, so I end up not bothering because 5-10 seconds of tone is a bit of a pain to try and use as an atmos bed in a scene. However, Douglas’ great trick opens up the possibility of now making use of these short snippets of sound to create endless tone from them. Therefore, I’m suggesting, as a subfolder within this collection, that we have a collection pot for any snippets or scraps of room tone from interesting spaces that you’ve recorded in but only managed to get short recordings of clean tone from. By sharing these, we hopefully will also have a folder of bits ‘n’ bobs that we can create endless other room tones from. I don’t normally let the club stray into the field of sound design, but this method of room tone creation is so dependant on it’s original source material that I thought it was worth starting a sub-collection of our field recordings to support it’s practice. Please read Douglas’ article carefully though please – he gives a very thorough description of how to make this technique work best. Please don’t share tiny 1 frame or 1 second samples – I would say that anything between 5 to 30 seconds is most appropriate. As Douglas explains, the slightest movement or change in sound creates a different tone so give enough of the recording to enable others to choose which fraction of it works best. Important point: you can only contribute to this ‘snippets pot’ if you’ve contributed a standard, long duration room tone recording to the collection. This ‘twist’ to the collection is simply a fun add-on, not the main focus of the collection – it may not even really work out, in which case I’ll ditch the idea, but I thought it was worth experimenting with. Any thoughts or suggestions below – now, let’s get back to collecting! Thank you all for your patience while new themes have been put on hold while I’ve been digging myself out of the admin hell that was switching cloud servers from Sugarsync to Google Drive – hopefully that hard work will be worth it in the long run. This entry was posted on August 12, 2013 by sonicskepsi. It was filed under Uncategorized .